Back in the 1920s, an ad for the dairy wholesalers that were occupying 134 Reade Street in New York proclaimed "We require the fanciest qualities to maintain the standard of our ‘BURMECO Quality.’ " The wholesaler is gone, the building long since renovated, but a century later, two things remain the same. The first is that people can still find excellent butter, milk, and cheese at that address -- they just happen to be ingredients in fantastic dishes at the restaurant now residing there. 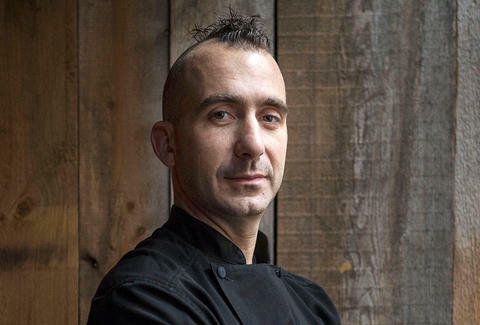 The second is that a devotion to quality is equally important to the current tenant: Chef Marc Forgione. That devotion was destined: Forgione’s parents were two chefs who met at culinary school. His father, Larry Forgione, was a member of the inaugural class at the Culinary Institute of America, and revolutionized farm-to-table sourcing in his restaurants. By establishing relationships with the farmers themselves, Larry was able to perfectly marry the nuances of their ingredients with his cooking. After a while, the elder Forgione’s restaurants -- as well as his practice of developing great relationships with producers -- spread across the country. “My father more or less created the food market scene in America,” says Forgione. From teenage years working in his father’s kitchen to stints abroad in England and France, Forgione made enough of a name for himself that he could put it on the signage. Restaurant Marc Forgione opened in 2008. 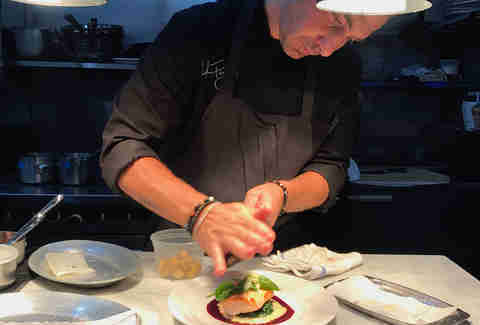 Two years later, his long history in the kitchen paid off in a unique achievement -- he became the youngest American chef to ever win a Michelin star in consecutive years. Just in case you thought he was slacking, he defeated nine other contestants to win The Next Iron Chef. A slew of high-profile openings continue to follow. He’s also taken his father’s farm-to-table mentality to the next level -- obsessively hunting for new products, new providers, and new flavors. While a normal restaurant might buy their produce, dairy, and meat from one major distributor, the younger Forgione doesn’t settle for anything -- which means he has “a guy” for almost everything. A normal restaurant might take half an hour to call in orders with their producers and distributors. With all of the particular producers that Forgione prefers, that process takes closer to two hours at Restaurant Marc Forgione. Forgione -- and by extension, the average diner -- is making the most of the growing availability of farm-fresh dairy. In turn, the farmers and vendors are growing more passionate in their presentation. Recently a yogurt vendor even told him to close his eyes before taking a taste. The chef might not have predicted the confidence that leads wholesalers to offer ingredients as experiential dishes even on the stockroom floor, but he very much believes in it. “People should associate farm to table with dairy as much as they do an heirloom tomato,” he says. After all, 97% of dairy farms are family owned, and most milk is made within a two-hour drive of where it’s sold. Every time a farmer blows Forgione’s mind with a delicious product, he then turns around and does the same with it for guests of his restaurants. So even if you think you know what to expect of yogurt, milk, or any other dairy product, do like Forgione and the farmers do; close your eyes, then take a bite. To see more stories from people who are undeniably devoted to dairy, head to UndeniablyDairy.org/devoted.